Today is Charles Darwin’s 205th birthday and a fine winter’s day to launch a new blog about ornithology, the scientific study of birds. We had hoped to lunch our new book on the modern history of ornithology today, but it will not be available for general distribution until Feb 26th, two weeks from now. You can read about it here, and on the other pages at this website. We are excited about this book, and it has already had some very gratifying reviews by both professional ornithologists and birders. 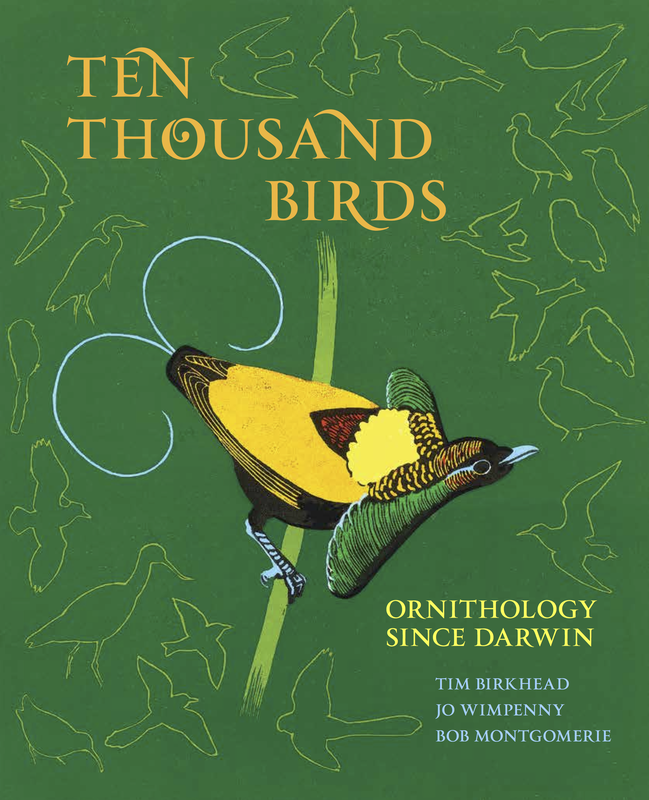 This blog is an offshoot of our extensive research on the history of ornithology that began with Tim’s The Wisdom of Birds, an overview of the entire history of ornithology, and culminating with our new book (with Jo Wimpenny) that focuses on the study of birds over the past 150 years, Ten Thousand Birds: Ornithology since Darwin. We began those projects in part because we realized how little our students and bird-minded colleagues knew about the history of our discipline. Our research students sometimes claim that anything published before 2000 is too old to be relevant, and our professional colleagues rarely have the time to read the general ornithological literature any more—as we point out in Ten Thousand Birds, more papers were published about birds in 2010 than in the entire period from Darwin to the end of the twentieth century. Most important, we realized from our own forays into the old literature that there is a wealth of ideas, data, inspiration, and lessons to be had there [see reading list below]. We wrote Ten Thousand Birds to bring some of that historical material to a more general audiencein a manner that we felt would be both interesting and accessible. In the process of writing, we realized that we would have to leave out much more than we included. This was necessary because the book would have otherwise been too large both for any publisher and for any reader to feel engaged for very long. So, what we put into both of those books is an eclectic mix that we felt were particularly interesting stories about subjects where the study of birds made important contributions to biology and to science in general. We now want to use this blog in part to tell about the wealth of material that we were not able to cover in those books. Our goal is to focus on the study of birds especially where we can provide some interesting historical context. To that end we will blog about interesting people in the history of ornithology, as well as modern discoveries about birds where we can provide some interesting historical background. We will also write about our own adventures as professional ornithologists and sometime birders. This is not another birder blog but we hope that birders read and contribute comments. There are dozens of excellent birder blogs out there including, in alphabetical order: ABA blog, Another Bird Blog, Bill of the Birds, BirdChick, BirdWatching, Stokes Birding Blog, and 10,000 Birds. This blog, Myriad Birds, is instead focussed on the scientific study of birds. We have been ornithologists for more than 100 years in total (we started young!) so we have a wealth of experience to bring to this blog. Tim has studied birds in Africa, Europe and North America, while Bob has spent most of his research time in North America and Australia. We are both interested in sexual selection and sperm competition but we have also published on mating systems, migration, song, breeding biology, foraging behaviour, parental care, genetics, and anatomy. Our intention is to blog about current research that catches our interest as well as about people, bird art, books, photos, and discoveries that we simply had no room to put in our books. In the course of writing Ten Thousand Birds we also interviewed about 50 working ornithologists and we will post those interviews here as well, as time permits. Our initial goal is to publish a new post every Monday and the occasional additional post during the week. We are both busy academics so even this seems like a daunting prospect. We suggest you subscribe to our RSS feed to get weekly updates by email, and also to our Facebook and Twitter feeds if you are into social media. For now, we will moderate your comments before they are posted on the blog. If you have suggestions for subjects that you’d like to read about, especially if they have a potentially interesting historical context, send us a note on our website’s Comments & Feedback page. Our blog title Myriad Birds is a bit cryptic. There are, of course, myriad birds—though the numbers of both species and individuals are dwindling at an alarming rate. The English word myriad, however, derives from the Greek word μυριάδες (myriades) which is the number 10,000, approximately the number of bird species in the world, and the reason for the title of our new book. In English, the word myriad has come to mean ‘some big number’ but we like the Greek definition when talking about birds. Ultimately this blog is about birds. Today in Kingston, Ontario, where Bob lives (and works at Queen’s University) it’s a frosty –23°C but sunny so the chickadees are trying out their spring songs, the juncos are lingering near the feeder waiting for one of the (too) many local grey squirrels to leave, and a peregrine is calling somewhere in the distance; in Sheffield, UK, where Tim lives (and works at the Univ of Sheffield) it is a much balmier 6°C and there are three pairs of bullfinches on his feeders, and pair of Peregrines in the University’s nest box [webcam link]. Birkhead, T. R., Schulze-Hagen, K. & Kinzelbach, R. 2004. Domestication of the canary Serinus canaria – the change from green to yellow. Archives of Natural History, 31, 50-56. Birkhead, T. R., Butterworth, E. & van Balen, S. 2006. A recently discovered seventeenth century French encyclopadeia of ornithology. Archives of Natural History, 33, 109-134. Birkhead, T. R. & van Balen, S. 2008. Bird-keeping and the development of ornithological science. Archives of Natural History, 35, 281-305. Charmantier, I., Greengrass, M. & Birkhead, T. R. 2008. Jean-Baptiste Faultrier´s Traitté general des Oyseaux (1660): an evaluation. Archives of Natural History, 35, 319-338. Charmantier, I. & Birkhead, T. R. 2008. Willughby’s angel: the pintailed sandgrouse (Pterrocles alchata). Journal for Ornithology, 149, 469-472. Montgomerie, R. & Birkhead, T. R. 2009. Samuel Pepys’ hand-coloured copy of John Ray’s ‘The Ornithology of Francis Willughby (1678). Journal of Ornithology. Schulze-Hagen, K., Stokke, B. & Birkhead, T. R. 2009. Reproductive biology of the European cuckoo Cuculus canorus: early insights, persistent errors and the acquisition of knowledge. Journal for Ornithology, 150, 1-16. By Bob Montgomerie in blogs on 12 February 2014 .